Learning how to stop a puppy from biting requires patience from both the owner and dog. Speak to any dog owner who has had the pleasure of those puppy years and you will hear about how that lapse in attention resulted in a chewed leg chair or a demolished sandal. In this article we will explore whether these owners are correct in what they say. 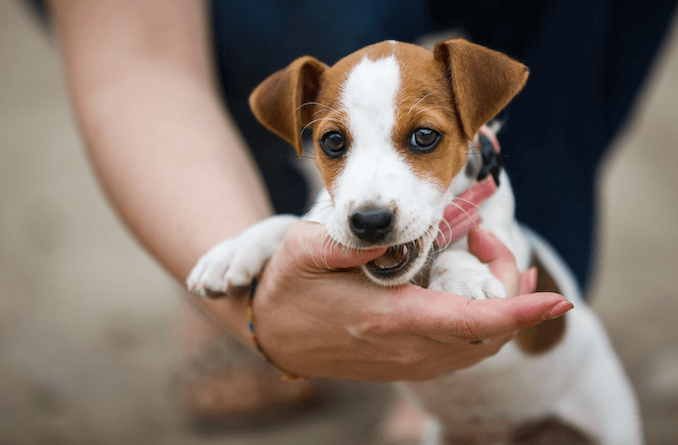 If you really want to understand why your puppy is biting, the different types of biting, and a full three step process on training your puppy not to bite then keep reading. Puppies use their mouths to play, explore and teeth. If you pay close attention to puppies playing, they use their mouths. There is a good reason for this, but to understand why, we must first look at their teeth in a little more detail. At 4 weeks old you will be able to see the development of a puppy’s 4 canine teeth. Puppies are born without teeth. At 2-3 weeks old, a puppy’s milk teeth will start to come through. These will be the incisors. Puppies should have a total of 12 incisors, 6 on the top and 6 on the bottom of the mouth. 4 weeks will see the development of their 4 canine teeth; these are those sharp long teeth. At any time between 3 and 6 weeks old, you should see them develop their pre-molars. 14 in the upper jaw and 14 in the lower jaw. At 8 weeks old, your puppy should have a complete set of milk teeth. What Age do Puppy Teeth Fall Out? 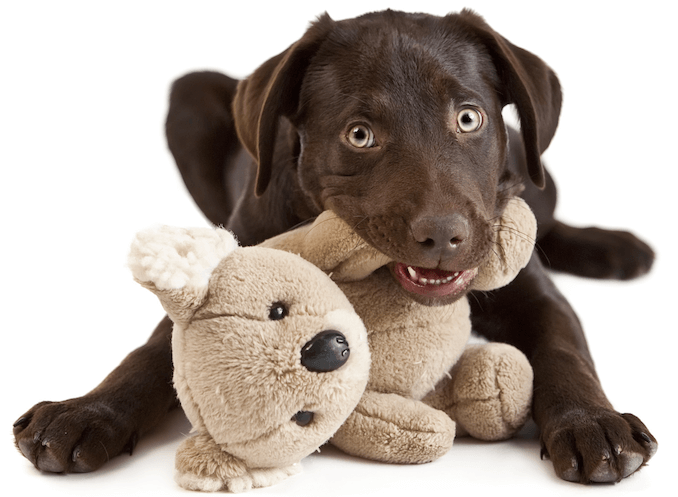 From 8-12 weeks onwards, your puppy should start losing their puppy teeth. This is due to the adult teeth forming and pushing the milk teeth out. You may find some around the house, but most puppies tend to swallow them. This can be a pretty painful time for your pooch; we’ll explore how to make it a little more tolerable later on in this article. This is a good time to see your veterinarian. This is to ensure the your puppy’s adult teeth are forming properly (i.e. don’t have developmental tooth abnormalities) and also to check they have a normal bite. This is because the upper incisors sit in front of the lower incisors when the mouth is closed. 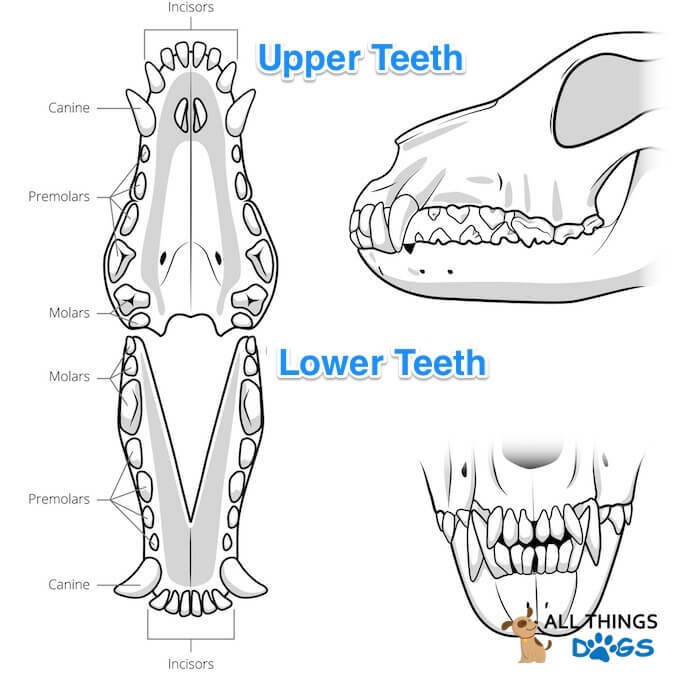 However, it is common for short muzzled dogs to have a reverse scissor bite where the lower incisors sit in front of the upper incisors. Most of their teeth will have fallen out by the time they are 6-8 months old and they should have a mouth full of adult teeth; 42 teeth in total. You will notice that the molars are new. Why Do Dogs Need Teeth? 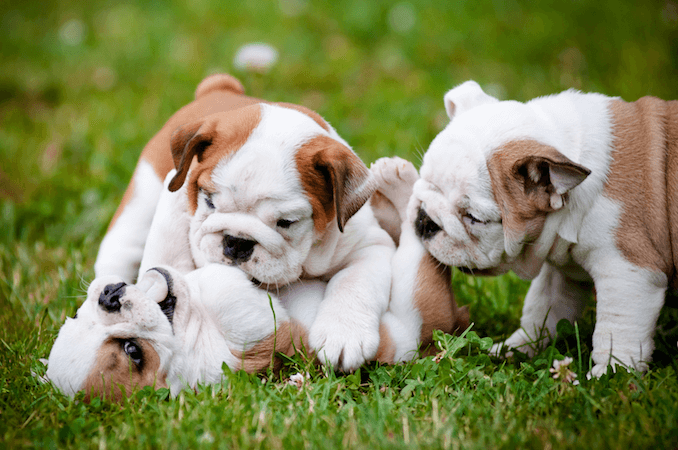 With the extra teeth and the addition of those for grinding and crushing, it is possible to see why bite inhibition in puppies is so vital. No one wants to be bitten by any of those teeth! It’s not just the teeth that we should be worried out, it is also the strength of the jaw. Thankfully, puppies have weak jaws. Jaw-adductor muscles generate the main biting force in dogs. As puppies grow, these muscles get stronger. Bite force therefore increases. Why Are Puppies Teeth So Sharp? Anyone who has been nipped by a puppy will remember those pin prick teeth. When those first sharp teeth start coming through, they will start to irritate the Mother making her reluctant to nurse and want to move away from her puppies, leaving them to search for alternative food sources. This is when the weaning phase starts. Those sharp teeth are the first step for those puppies becoming independent. They learn that they need to seek out other food sources. Their survival depends on it. Sharp teeth don’t only irritate their Mother, they also annoy their siblings. Which leads us into the other reason puppies bite and why you will constantly see puppies using their mouths whilst playing. Puppy biting aids the learning of bite inhibition. It is crucial that puppies learn bite inhibition, we discuss this in far more detail below. So those sharp teeth kick start the weaning phase through their Mother’s reluctance to nurse and they also aid the learning of social etiquette. To quickly stop a puppy from bitting you must withdraw attention, provide positive reinforcement and provide alternatives. Below are fast techniques to stop your puppy from biting. 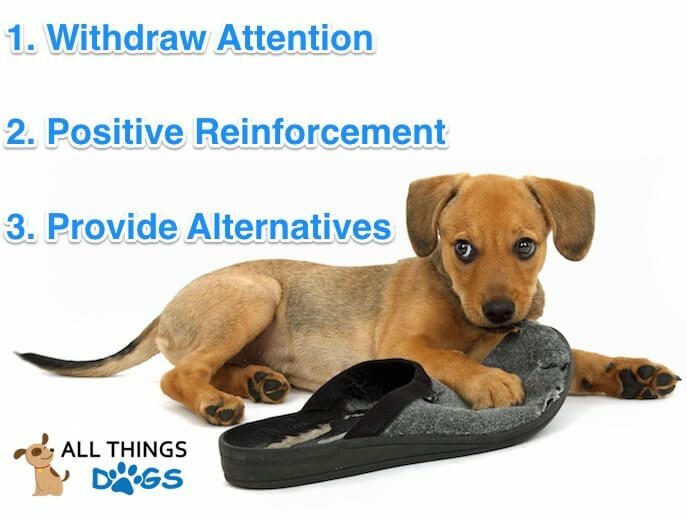 Withdraw attention – your puppy must learn that when they bite, the good thing goes away (see below on bite inhibition). Positive reinforcement – when your puppy is playing appropriately, play continues! Which is what they want! 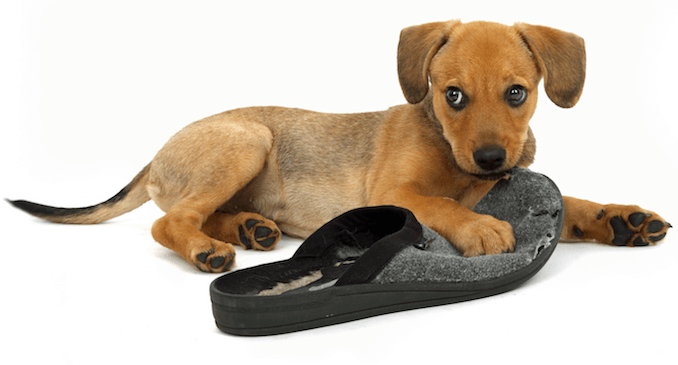 Provide alternatives – take the slipper off them and give them their own rope chew or toy. Encourage the behaviour you want to see! Sometimes, stopping a puppy from biting, requires a greater understanding than the three bullet points above. A puppy’s owner must understand bite inhibition, triggers and types of biting. Then we share with you a training plan to prevent your puppy or mature dog from biting. This is where a puppy will learn to limit the force and strength of their bite. It teaches them that other dogs and humans are fragile. A dog has one defence mechanism and that is to bite. Every dog is capable of biting out of fear and anxiety, bite inhibition is a vital technique to limit the damage a dog can do. Puppies play together by chewing and nipping. When puppies are playing together; chewing and nipping, if they bite just a little too hard, those sharp teeth will hurt their sibling. You will often hear a loud squeal or yelp. This tells the offending puppy that it was a little too hard. Play after this interaction will usually stop, so by trial and error, puppies learn that when they bite hard, play stops. This is known as operant behavior; where your puppy’s behavior is being controlled or influenced by a consequence. So we can see why learning bite inhibition at an early stage is important. Dogs who learn how to use their mouth gently are less likely to bite hard or break skin if they do ever bite a person out of fear or anxiety. But outside of mother and sibling interactions, how do we teach bite inhibition? If your puppy nips or mouths at you during play, withdraw attention. Turn away from them. Remember that trial and error, when I bite hard, the good thing goes away? Whilst your puppy is playing appropriately, let play continue. You want them to learn what behaviour is acceptable. This is reinforcing the behaviour you want them to demonstrate. They can chew their own toys, just not your favourite pair of slippers! What If I Rough Play With My Puppy or Play Tug of War? 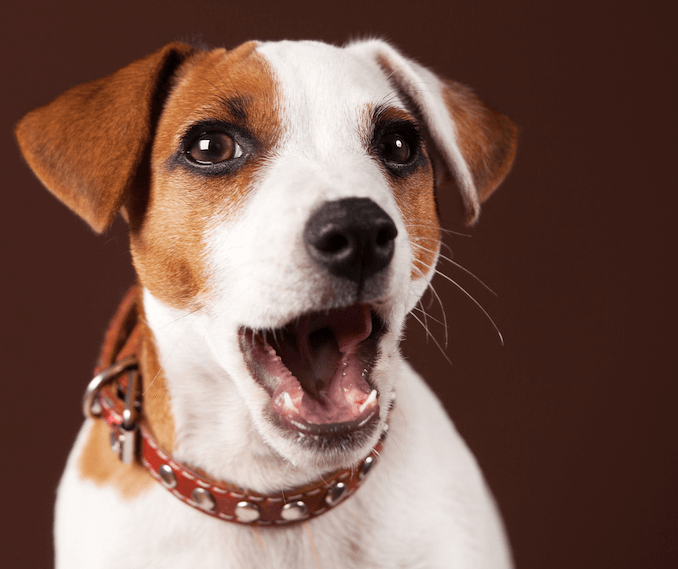 A Puppy’s jaw muscles and teeth are not properly formed until they are matured; this can be from 6 – 24 months. Their teeth can easily be jarred or moved causing abnormalities. If you have children, they are usually the ones who end up rough playing with your puppy. The important thing with teaching bite inhibition is consistency. Everyone in the family needs to be teaching the same thing. Rough play is acceptable, as long as, the minute there is contact between human skin or clothing and your puppy’s mouth, play is stopped. The same goes for tug. You want your puppy to learn that lively and energetic play is acceptable, biting people or their clothing is not. As much as we would like to think our puppies will run around the dog park, happily playing and chasing other dogs, puppies can develop aggressive tendencies. When biting is accompanied by a fixed gaze, a stiff posture and deep tone growling it can be indicative of aggressive intent. Aggression in puppies can be as a result of many things, they simply learn that aggression can solve problems for them. Anxiety and frustration can be as a result of punishment. A puppy will display three or four different types of bite during their life. Understanding the different types of bite, and how to identify them, is important so you understand what behavior you need to focus on during training. Your dog will display a different body language depending upon which bite they are using. 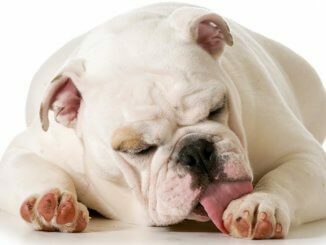 If you dog has a relaxed face during biting they are most likely exploring and playing. Aggressive and guardian (i.e. territorial) dogs will have mouthing accompanied by a stiff body, wrinkled face or snarling (exposed teeth). This is usually indicative of building aggression and a bite could soon follow. 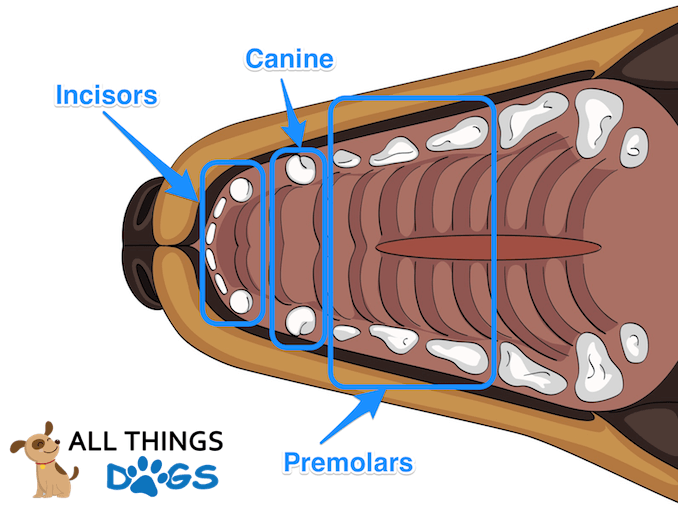 Now you understand a puppy’s jaw and teeth formation and the anatomy of their mouths, bite inhibition in young and old dogs and triggers behind bitting. It is time to train your puppy to stop biting. Remember the fast three techniques earlier; withdraw attention, positive reinforcement and provide alternatives? Withdrawing attention is the easiest. As soon as there is mouth contact to skin, withdraw attention. Provide alternatives when necessary, such as chew toys or stuffed animals to carry. It is possible to withdraw attention in the form of time out. This should only be used with healthy and stable adult dogs, as using time out with anxious dogs and puppies can fuel separation anxiety. 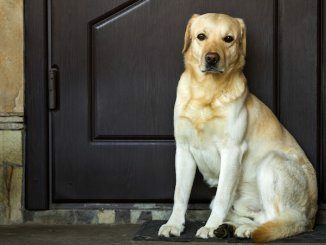 Time out can be achieved by moving the dog to another room in the house, separated by baby gates or barriers. Attention is withdrawn and with the removal of stimulus, the dog can calm down. Positive reinforcement relies upon priase and encouragement. When teaching bite inhibition in dogs it is important to avoid the use of punishment. Quick tip to train the stop command. Have your dog walk up to you, then throw treats towards him and behind him. As he stops to eat the treats, shout stop. He will associate the stopping with the command. Repeat this exercise until he will stop on command before you have even thrown a treat. You can then use this command during play when you feel a bite or nip on your skin. How Do I Stop a Dog from Biting? We’ve established that the hope would be to teach bite inhibition from an early stage. This helps to avoid any difficulties as a dog gets older. But what do we do when a fully grown dog is biting? Firstly, if a dog is aggressively biting and causing harm, it is recommended to seek professional advice from a qualified behaviourist or trainer. What we are discussing here is playful nipping behaviour and mouthing behaviour in grown dogs. Certain herding breeds such as border collies and Australian cattle dogs will be more likely to nip at people’s feet and legs as this is historically what they would do to the animals they were herding. Work on your dog’s attention and focus through positive reinforcement techniques. Work on command training including: sit, stay, leave/off and stop. Ensure your dog is adequately exercised and stimulated – herding dogs get very bored! Reinforce the behaviour you want to see and distract from the behaviour you don’t! Withdraw attention when the nipping starts – stop moving! We’ve established that puppy biting, mouthing and nipping is a completely normal behaviour. It is the first step in learning to be independent through the withdrawal of nursing mothers and also the first step in learning social etiquette when they bite their siblings just a little too hard. Through these behaviours puppies learn bite inhibition, which is a vital skill as they get older. They learn that other dogs and humans are fragile. As owners, we need to continue to teach this bite inhibition even into adulthood if necessary, for the safety of other dogs and humans. Nipping is typically light nibbling between puppies during play and exploration, it is usually accompanied by an excited and happy puppy! Mouthing normally occurs during teething and can easily be spotted as your puppy will be gnawing. Biting is normally displayed by aggressive or territorial dogs who have not learned bite inhibition. 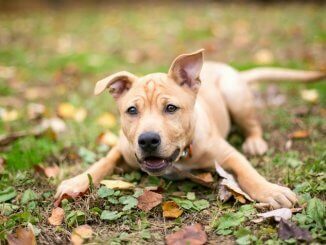 After reading this guide you should know exactly how to stop your puppy from biting. Remember withdraw attention, positive reinforcement and provide alternatives whenever you feel their teeth on your skin. You can achieve this by not playing with hands, stopping play immediately once bitten, prventing the use of loud noise, redirecting their attention (i.e. give them a toy), and timeout.